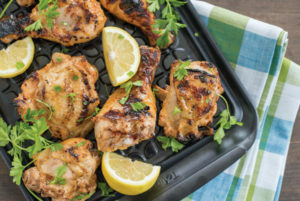 Featuring ingredients across the food groups, these dairy-fueled recipes from Milk Means More are ideal for well-rounded meals filled with nutritious flavor. Zesty mustard, spicy Sriracha and rich buttermilk lend a marinated flavor upgrade to traditional grilled chicken, while homemade pesto, fresh corn and ham create a perfect harmony for a cheesy grilled pizza. 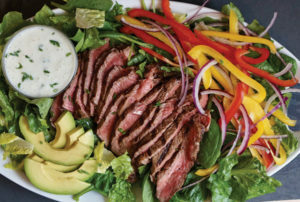 Or make a salad the star of your dinner table with a simply seasoned sirloin steak, plenty of veggies and a tart twist on a creamy dressing made with yogurt and milk. To make dressing: In blender, combine yogurt, lime juice, milk, chives, garlic, salt and pepper. Blend on low until smooth consistency forms and chives are completely incorporated. Transfer dressing to jar with tight-fitting lid and refrigerate until serving. To prepare steak: Combine kosher salt, black pepper and granulated garlic to create rub. Sprinkle half of seasoning mix over one side of steak, pressing it into meat. Repeat with remaining seasoning on opposite side of steak. Grill steak over direct medium heat to desired level of doneness, approximately 4-5 minutes per side for medium pink center. Remove steak from grill and let rest 7-10 minutes on cutting board. To make salad: Toss spinach and romaine on large platter. Scatter red and yellow peppers, avocado and onion over greens. Slice grilled sirloin thinly against grain. Arrange meat slices along center of salad. Drizzle dressing over salad just prior to serving. Modern Dentistry in a caring, home-like atmosphere including General Dentistry, CEREC Dentistry, Sedation, Fast Braces.